Democratic Alliance picket at Department of Defence. 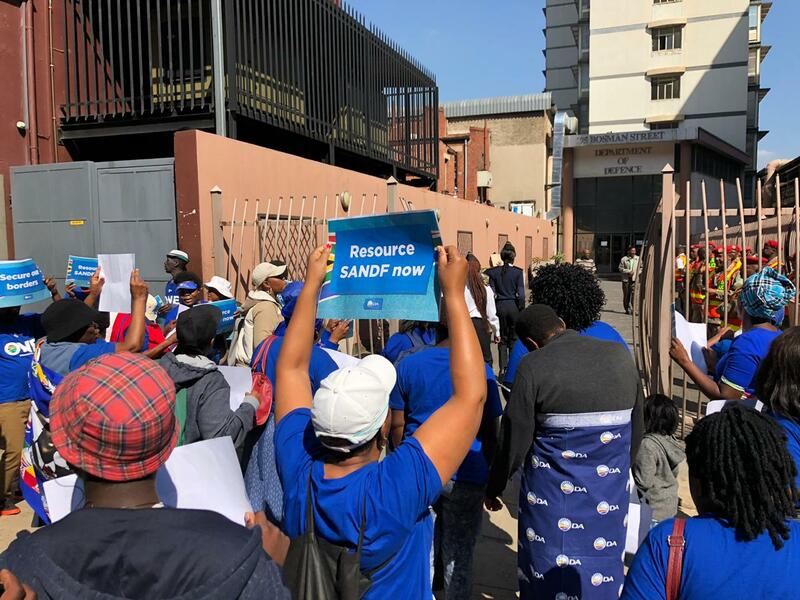 The sorry state of funding for the national defence force, particularly as regards its border protection tasking Operation Corona, took to the streets by way of a Democratic Alliance (DA) picket outside a Department of Defence (DoD) building in central Pretoria. “The SA National Defence Force (SANDF) is in desperate need of restructuring,” Jacques Julius, DA Team One immigration spokesman said. “It is urgent for the SANDF to be immediately restructured,” he said, adding the DoD apparently ignored warnings emanating from the Defence Review. He went further saying “a dire warning” by SANDF Chief General Solly Shoke about the inability of the SA Army to exercise control over South Africa’s land borders was also ignored. “The SANDF is a critical player in our national effort to curb illegal immigration and cross-border crime. We can no longer allow the DoD to sit on their hands when the interventions necessary to fix our army are well documented. “We need to reprioritise spending on the army. We should have a cost structure of 40% on human resources, 30% on operations and 30% on equipment. Currently, we are allocating a shocking 59% to human resources, leaving far too little for conduct of operations and maintenance of equipment. “This is unsustainable. With an almost 60% spend on human resources, we are unable to deploy the full complement of 22 units needed to ensure our borders are secure. We are not receiving the value we need for the money we are spending. South Africans are being dealt a bad hand. We must work with National Treasury to craft an exit mechanism for excess staff,” Julius said outside Poynton’s Building on the western side of the Pretoria CBD. His message to those who joined the picket was the DA plans to put the brakes on illegal immigration by properly resourcing the national defence force. A day after the Tuesday picket Brigadier General Mafi Mgobozi, SANDF Corporate Communications Director, said there was concern about “certain political parties” using the name of the national defence force in election campaigning. “It is unfortunate that at a time of charged political electioneering, some of our fellow South Africans fail to comprehend the constitutional requirement to keep our national defence force outside the spectre of political opportunism that dominates the theatre of election season. “The SANDF serves the constitutional government of the day, regardless of affiliation and is an apolitical national asset that belongs to all the people of South Africa. It discharges its mandate in the peoples’ interest without advancing the interests of any political party and will remain like that. “The SANDF urges political parties not to draw the SANDF into their election campaigning,” he is quoted as saying in an official SANDF media statement.